Welcome to this Weeks edition to Maritime Monday. Tell a friend about this post if you enjoy what your reading. Here are some railship photos. 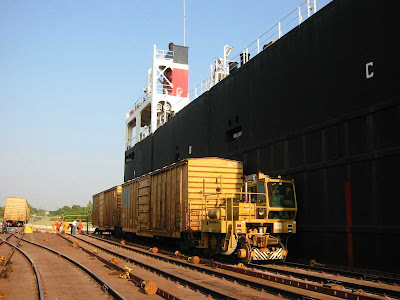 They operate the railships BALI SEA and BANDA SEA. Photos are from the presentation available on their homepage. 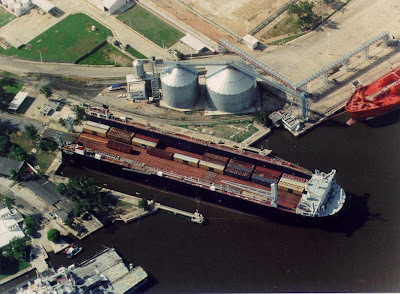 American Shipper also has a story on the company at "Where the rail meets the water"
Eagle Speak has "Caribbean basin terrorism concerns?". EagleSpeak also has his weekly series "Sunday Ship History: Beach Jumpers"
Shipping Times (UK) has the ITF's backing of the IMO plan to allow foreign warships to enter Somali waters to fight piracy. The hope is that the Somali Government will now request the UN Security Council to approve the plan. Smit Salvage has raised the MIGHTY SERVANT 3. 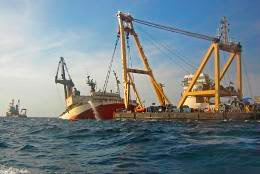 The MSC NAPOLI still remains where it was left, but salvage of the vessel itself continues after full discharge of the cargo was completed in May. It should be refloated any day now. 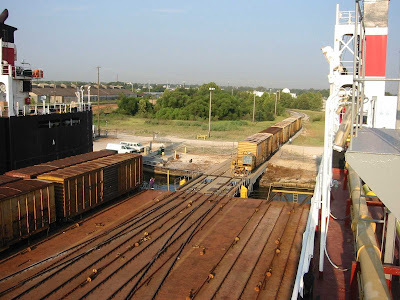 Cargo Law has the container stack disaster onboard the M/V ITAL FLORIDA. gCaptain remembers the PIPER ALPHA disaster that took 167 lives. It was the worst offshore oil accident. They also point to other rigs disasters here. Tims Times appreciates the oxygen he breathes a little bit better, while discussing submarines. "recently had the Coast guard come aboard and do a surprise security inspection. I got scolded for not checking their ID and checking their bags"
The Baltimore Sun's hitpiece on the US Coast Guard is located at "Justice capsized?" The story included allegations that the Coast Guard's administrative law judges were ordered to always rule in favor of the Coast Guard in cases brought by the Coast Guard against merchant mariners. Eagle Speak has the Coast Guard's response to the story above. EUobserver has "Malta turning into 'detention centre', warns minister"
The Stupid Shall be Punished has the arrest of the Disbursing Officer of the USS McCLUSKY who managed to steal $140,000 from the vessel's safe over the course of ten months in pursuit of a Nigeria email scam. Sailors, Mariners & Warriors League has the detention of the Cyprus-Flag bulk carrier NIKOLAOS P in the UK for being a rustbucket. Life at Sea has a post about legendary explorer Captain Jakes Cook. The Pilot Boat has photos of Thailand-Flag general cargo vessel SAFMARINE LUBA. Job Vent has sailor reviews of sailing with Military Sealift Command. US Officer Union Master Mates & Pilots has the EU's failed attempt to amend the Facilitation of International Maritime Traffic Convention to permit countries to request crew visa information from arriving ships. This seems to be an end-run around the ILO's Seafarer Identification Convention. This convention is looked after by the IMO. 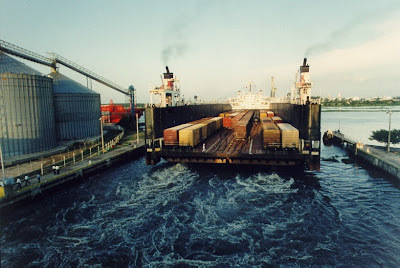 The coverage is a little distorted as the issue appears to be the transmission of data on visas held by crewmembers, while it is portrayed as a requirement for seafarers to have visas. As some countries already require this, it hardly makes sense to think that fighting such a measure at the IMO will prevent other countries from requiring visas if they want to. Philly.com has a story about the now very busy Aker shipyard in Philadelphia. Maritime Global Net has Shipping Company Safmarine's response to concerns that it is transporting illegally-felled timber from West Africa to Europe most recently on the SAFMARINE ONNE. Greenpeace has "Congo timber ship blocked" Wow! The EU seems to really love that illegal old-growth rain forest timber. Why is it that Greenpeace has to step in? Where are the EU Customs Authorities? Japan Today has the story of a murdered 14 year old Thai girl found on a Japanese-owned Panama-Flag vessel. Molten Eagle fights against feminization of the US Navy's submarine force. Neptunus Lex has the protests by local communists over the arrival of the USS NIMITZ in India. EU Referendum also has the EU's attempt once again of creating an EU Coast Guard. I am not sure where that will go as France a couple years back proclaimed that it did not have the funds to create and maintain a US style Coast Guard. Popular Science has the proposed system to screen container cargo offshore. Times-Herald has the upcoming return of WWII 'Mighty Midget' landing craft support ship USS LCS (L) 1-130 from Thailand where it has been in service with the Royal Thai Navy for more than 40 years. The sad voyage of the SS ST. LOUIS was covered in Maritime Monday 59. Turns out that was not the only passenger ship carrying Jewish refugees to the US. The NY Times has a story on the voyage of the chartered cargo ship QUANZA that carried jewish refugees from Europe. They eventually received visas to enter the US but only after direct intervention by First Lady Eleanor Roosevelt. Juneau Empire covers the Sailor superstition about bananas. Gizmodo has "Jet Kayak is Fast, Dangerous and Awesome". Mr. Boat Blog has the world's largest sailing mega yacht, as built by mogul Tom Perkins. Never Sea Land covers the receding Arctic Ice Cap. "YOU SAVED MY LIFE AND BANK FUNDS"
Since When Do You Need a Bed for an All-Nighter?